Alternative GenHist: Y-DNA, Antichrist and the Temple Priesthood: Who are the True Descendants of Aaron and Levi? Y-DNA, Antichrist and the Temple Priesthood: Who are the True Descendants of Aaron and Levi? Many of the Fathers of the Church speak about a future false Messiah or Anti-Christ who pretends to be a descendant of the Davidic House but is actually from the Tribe of Dan (possibly of N-L666 y-dna). 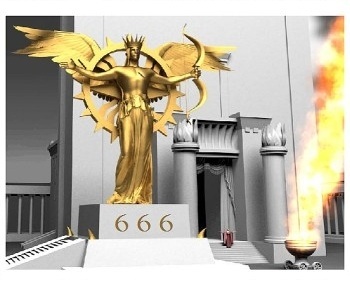 This Anti-Christ will rebuild the Jewish Temple with a false priesthood. It would seem today that there are vested interests that wish to see the Jewish priesthood (cohenim) as belonging to the Assyrian-Arabic-Samaritan clans found within J1 (descendants of the Samaritan High Priest Ishmael of First Temple times) and J2 ydna (descendants of the Samaritan priest Tzadok who became a Jew in Second Temple Times and founder of the Saducees) that descend from Ishmael not Isaac - the so-called CMH. They may be supported by Levites from the Samaritan Levites of E1b (actually Japhethites descended from Javan) and the Ashkenazi Levites (actually descended from the sacred clan of the Tengri Turks and Khazars who belong to the Tribe of Eastern Manasseh or Gilead and thus descend from Joseph not Levi). Today the true R1b descendants of Aaron and Levi are being told they descend from converts. One day in the near future the Great Catholic and Davidic Monarch of the Davidic House of Nathan (R1b L21) will restore the true sons of Aaron and Levi to their positions of honour in Israel. Who then are the true y-dna clans of Levi and Aaron? They must belong to R1b so any claimant that is not R1b is not a direct male line descendant of Levi even though they may be descended from Levi through a maternal line. The sons of Moses are also Levites so that all those of R1b V88 y-dna are of true Levite male line ancestry. Also those who are R1b PF7562 Y31335 ydna are most likely Levites as well as R1b Z2103 L277.1. Another clan of Levi is most likely R1b ZZ337 found among the Lost Tribes. The true male line descendants of Aaron belong to R1b Z2103 L584 and possibly PF7563*. Yeshua or Joshua the son of Jehozadak who was the first Jewish High Priest after the Babylonian Exile was most likely the founder and ancestor of R1b Z2103 L584. His son the High Priest Jehoiachim or Joachim was in the time of Judith and the Babylonian King Nabonidus the Assyrian. I am not saying that those Jews who are not R1b are not true Jews- they are. However they are not of direct male descent from Judah or Levi. The Jewish J2, J1, E1b clans have been Jews since Second Temple Times in many cases. Nor am I saying that all Jews or others who descend from these clans are evil or bad. However they may be used by the Evil One and his servants for their own purposes and because of certain inherited traits they may be more attracted to the deceptions of the False One. Nor am I saying that those of R1b y-dna will not accept him but there may be certain traits in their physical and spiritual dna that makes them more resistant to his deceptions. The Holy Scriptures states that there will always be earthly descendants of David who sit on the Throne of David and that there will always be descendants of Aaron (Cohenim) and Levi (Levites) to minister before him while there is a sun and moon. There will also always be a Successor of Peter (Apifyor) who is not a cohen (Jewish priest) but a parnas (Presbyter or Christian priest). A cohen could be a new covenant parnas or a Jewish parnas but only a new covenant parnas or a Jewish parnas descended from Aaron could be called a cohen. However the Christian priest combines the roles of a parnas (as an overseer and father), cantor (as a liturgical celebrant), cohen (as a sacrificer and blesser), shamash (servant to the people), rabbi (teacher of the faith) and Tzadik (one who intercedes and does reparation for others). A Christian priest receives smicha (laying on of hands) and anointing with sacred oil at his ordination or investiture. As the Successors of Moses received smicha to authorise their Mosaic teaching authority so Christian smicha comes from the Messiah laying hands on the Apostles and the Apostles on the Bishops (hegmon parnas). I really enjoy your writings. Interesting history for sure. I'm R1B-L21 DF13 so I find this very informative.